Amsterdam Vehicle 2 Grid continues its expansion. 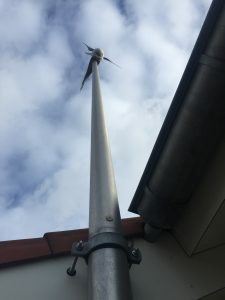 After two years of running with the connection between electric vehicle and household, the system was reinforced in March 2016 with a 550 Watt windmill. This new source of energy will produce around 350 kWh per year, enough to cover 10-15% of the household energy demand. 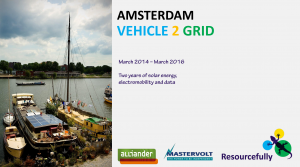 Amsterdam Vehicle 2 Grid will explore how wind energy complements in practice the solar production over the year. The Croatian foreign-politics magazine “Paralele” dedicated on March 18th 2016 some minutes to Amsterdam Vehicle2Grid. The program highlighted the necessity of gathering data and using new technologies in order to improve energy efficiency. You can see below the section dedicated to the project, highlighting the energy management system from MasterVolt and the impressive increase in energy autonomy up to 60%. Through Electric Vehicle participation the energy autonomy more than doubled in Amsterdam household. 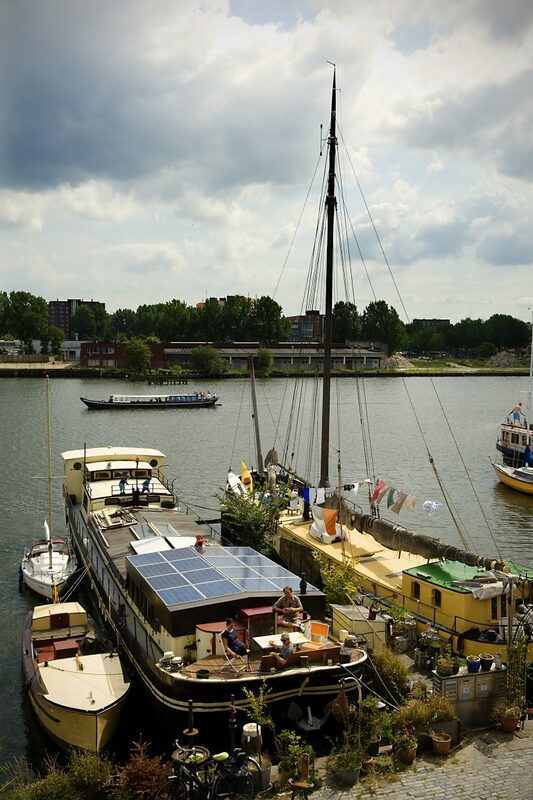 Goal of this ‘living lab’ in the Amsterdam Vehicle 2 grid project is to investigate the contribution of smart energy storage to sustainable urban development. 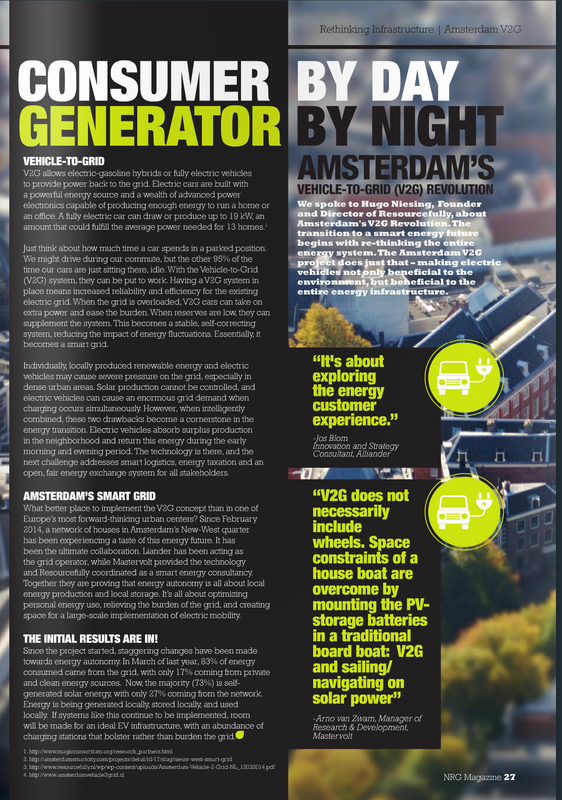 Since April 2014 an Electric Vehicle participates actively in the electricity system, storing surplus of production during the day and providing this stored energy by night to a household in Amsterdam. The electricity produced and consumed by this household is in balance over the year. But because production and consumption do not match 74% of the consumed electricity was injected in and extracted from the grid. This ‘energy in-balance’ increases rapidly due to growth of both electric vehicles and solar energy installations in cities. Besides unnecessary transporting and converting energy, the electricity grid suffers congestion peaks. But smart solutions can turn problems into solutions. 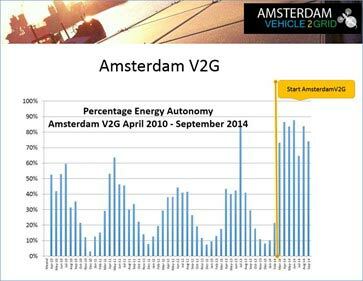 The project Amsterdam Vehicle 2 grid aims to demonstrate this in real life. Electric cars are parked most of the time, a fleet of electric cars could increase de facto the capacity of a city to run on renewable energy produced in or nearby the city. The project has now over 1 year results. With smart use of the electric vehicle the grid dependence of the household dropped from 74% to 40%, while system optimisation and improvement is ongoing. Renewable Energy potential & Electric VehiclesThis project allows the comparing of energy performance of a City without and with V2G technology. Further modelling and extrapolation to different scales of implementation in the city is done in collaboration with the Amsterdam University of Applied Sciences. 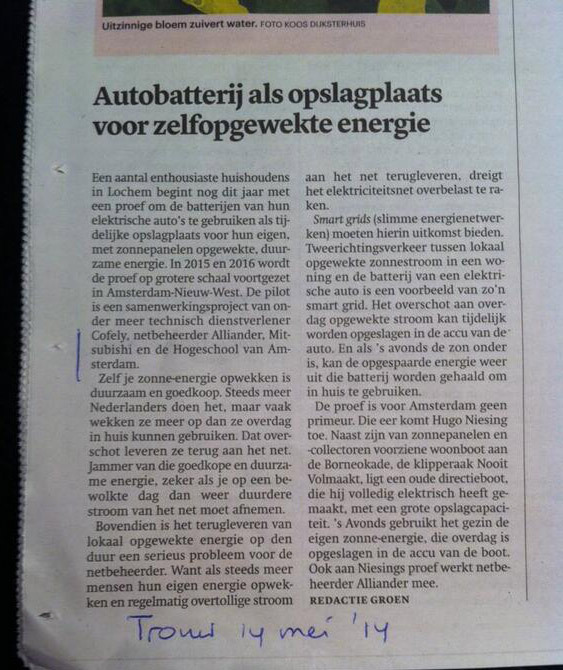 Car battery as storage for self-generated energy! 14 May 2013: Resourcefully and sustainable behaviour discussed by Hugo Niesing in the latest edition of the NRG Magazine. This magazine has reached its 10th edition and presents discussions about climate change, sustainability, local action and the rewarding road of transition. When “We need energy efficiency.” became the main message of the International Energy Agency in 2012, the NRG Magazine decided to dedicate a special section to this topic. With climate change challenges becoming acute and local governments putting considerable effort into plans and projects to make their regions more sustainable, we thought the best way to present how energy efficiency can be pursued is by having somebody who has already been successful in it, talk about it. Hugo Niesing was willing to contribute to the Energy Efficiency section, discussing the REloadIT project and how he is living in a self-sustaining home, powered by renewable energy.